The movie buffs are super excited for the upcoming Dharma Productions' venture, Kalank. In the past couple of weeks, the makers have released a teaser and two songs - Ghar More Pardesiya and First Class - from the film. 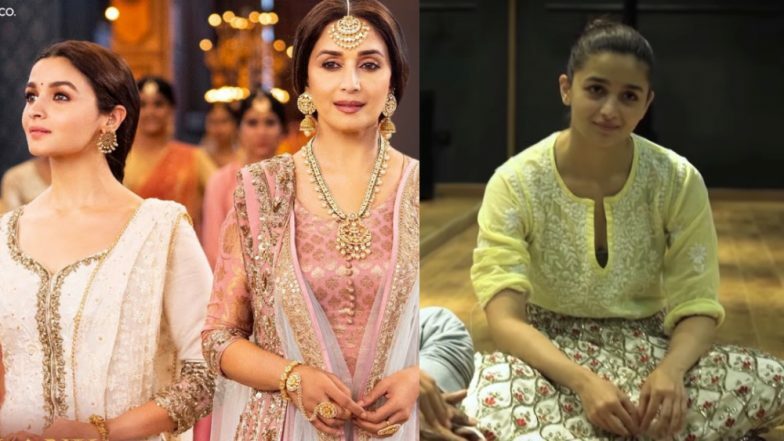 Today, the internet got its hands on the making video of Ghar More Pardesiya, the song in the film which has Alia Bhatt and Madhuri Dixit's characters having sort of a dance-off. The music video has brilliant production value, with marvellous sets and beautiful cinematography. In the making video, we get a better look and understanding of how this world of Kalank came to be. 1. A team member explains Abhishek Varman, director of Kalank, made sure they had a storyboard ready one year ahead of executing the shoot. The references for the sets have been pulled out of the Ramayana. 2. Alia Bhatt reveals that her character is walking across the streets of Heera Mandi in the song and she has come here for the first time. 3. "Creativity in that song is amazing. The imagery is just mind-blowing," Madhuri says. She adds, "The relationship between me and Alia gets established in the song,"
4. Alia reveals that she has never trained in Kathak before this song. She added that she was relieved that she did not have to dance alongside Madhuri in Ghar More Pardesiya. Kalank Song First Class: Varun Dhawan's Swag and His Chemistry With Kiara Advani Are Both First Class! - Watch Video. 5. The chandelier in the song was set up by a Lucknow based artist in a very short period of time. The set was looking so beautiful that Karan Johar, producer, gasped upon seeing it. So, these tiny revelations have made the Kalank song, Ghar More Pardesiya all the more interesting for us. The song has been choreographed by Remo D'Souza. It has been composed by Pritam. Lyrics have been penned by Amitabh Bhattacharya and the voice is of Shreya Ghoshal. All the artists make commentary in the making video of Ghar More Pardesiya. So, do not miss it.